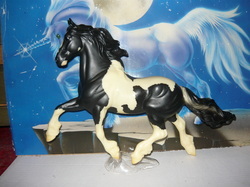 Enchantress-1995 black tovero. Sired by The Lob Eared Horse-r, out of The Horse Shoe Mare-r. Bred in England and imported as young stock. Hot Diva-2001 black tovero (tobi+sabi). Sired by The Kent Horse (r), out of Wilkshire Filly (r). Bred in England and imported as a weanling. 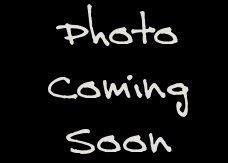 Wheres The Name-2003 bay tobiano. Sired by Charile-r, out of Rosa Jo-r. Linebred to The Roadsweeper (UK). OF Grand Champion, Lady Fair. 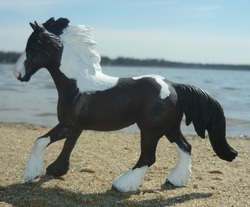 Maiden ofthe Kingdom-2003 black tobiano. Sired by Latcho Drom-r, out of Dolly-r.
Homo for tobiano, meaning she will always produce tobiano foals. Grand Champion mold but is not a GC, no GC marking on her. The Spotted Ghost-2006 bay spotted blanket. Sired by Hermits Lonely Ghost-r, out of Hermits Splash. 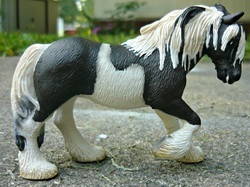 Will bea CM Cob resin. Smoky Diva-2006 smoky black tovero (tobi+sabi). Sired by Clononeen Mull of Kintyre (r) (aka Romeo), out of Hot Diva. Shadow Dreamer-2007 black silver. Sired by St Clarins (r), out of Dottie Lady (r). 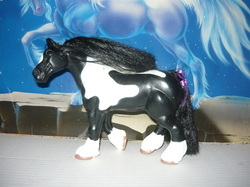 Gypsy Windflame-2008 black tovero. 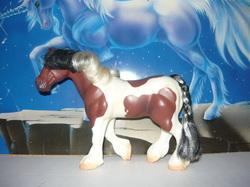 Sired by Gypsy Winddancer, out of Felicity-r.
OF Breyer Kuchi, also signed. 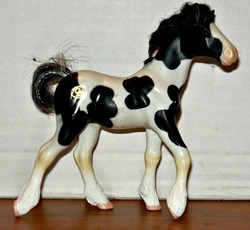 Hidden Maiden-2008 buckskin tobiano. Sired by Love Biscuit (r), out of Maiden ofthe Kingdom. Wheres The Love-2008 buckskin tobiano. Sired by Love Biscuits (r), out of Wheres The Name. Twisted Translator-2011 bay tovero. Sired by Taskin (r), out of Stonehaven Lady Maizy (r). 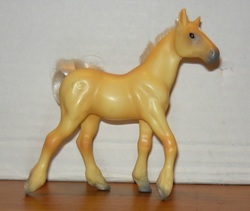 Sundance Flame-2013 buckskin tovero. Sired by Sundance Kid (r), out og Gypsy Windflame. Light of Kintyre-2013 perlino tobiano. Sired by SFC King of Kintyre, out of SFC Holly Golighty. Bred by Golden Hart Estate. Golden Jewel-2014 palomino. Sired by New Gold Standard, out of Bonnie (r). Spotted Caramel-2016 buckskin leopard. Sired by Caramel Popcorn of FHF (r), out of The Spotted Ghost.